Lake Superior's Devils Island is one of the twenty-two Apostle Islands of northern Wisconsin. The politician and author Samuel Fifield wrote in 1899 that, "The Indians in the early days declared it to be the home of Matchimanitou, the "evil spirit," whom Kitchie-Manitouo, the "great spirit," had imprisoned there. Hence its name, Devils Island." When surf on Lake Superior is heavy, the waves thunder and boom in the island's extensive sea caves. The rumbling can be heard even well away from the shoreline. Local residents claim that the Ojibwe (Chippewa) interpreted this noise as the sound of evil spirits. The island has dramatic rock formations and sea caves that wrap around its northern shore. 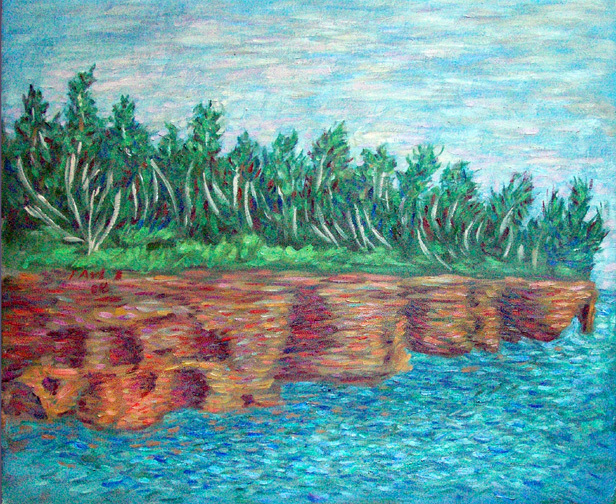 I love the birch trees being whipped around by the wind and the red, gold, and violet tones in the rock, along with the blue green water of Lake Superior. I was there in mid-June, 2008, and it was freezing.